Twinsburg, Ohio, May 24, 2017, Copperloy announced exciting time-saving enhancements to its lineup of OHSA-compliant industrial yard ramps for unloading and loading. Already convenient and safety-focused, the company’s ramps now offer a variety of new features to make them even more efficient for material handling needs at factories and warehouse facilities. 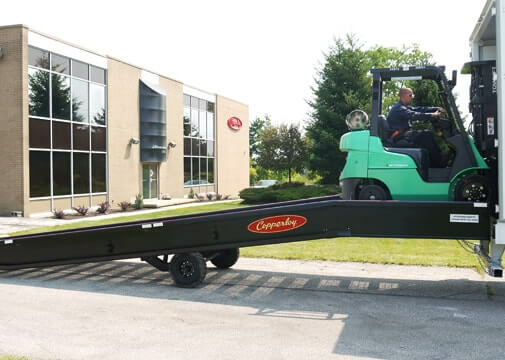 Copperloy has revamped their yard ramp with a one-cylinder design that uses less pressure to lift the ramp when compared to traditional yard ramps with two-cylinder hydraulic systems. This allows for not only easier operation, but faster raise time as well—up to two-and-a-half times faster than the average industry ramp. A traditional two-cylinder pump can raise unevenly due to a variety of conditions, including general wear. Copperloy’s one centrally located cylinder guarantees that the ramp will rise evenly every time. Pump location on the outside of the ramp frame allows for easy access at all times. Solid-filled pneumatic tires can handle rugged terrain without the potential for punctures or air pressure problems. Rotation occurs on the redesigned positioning sleeve instead of the ramp connection, reducing wear on the ramp structure. Position sleeve has three points of connection, which greatly reduces the likelihood of it disconnecting during irregular maneuvers. Watch the comparison video showcasing the time-saving efficiency of Copperloy’s redesigned yard ramp versus standard industry ramps. Contact Copperloy to find out more about the benefits of one-cylinder hydraulic yard ramps. For additional information, contact us at 1-800-321-4968.
guard can easily be retro-fit to anyexisting JH Industries 2-Hole bumper design. edge of dock levelers can be avoided. by eliminating the need for frequent bumper and edge of dock replacement. Twinsburg, Oh – January 2007 JH Industries introduces the New Copperloy “SEL” series Edge-of-Dock Leveler. Our new Edge-of-Dock Leveler offers a smoother transition for loading and unloading trucks as well as an overall more durable product. The “SEL” series Edge-of-Dock is available in 20,000 lb. and 30,000 lb. capacities with lip lengths to accommodate both standard and refrigerated trailers. The newly designed linkage assembly relocates weldments to reduce the risk of potential truck impact, which also allows for greater weld penetration and support of critical hinge tube locations. Our new bushing design on the roller pin assembly as well as the linkage bar reduces wear and eliminates the need for routine maintenance of these parts. The linkage bar has also been designed to automatically “kick-out” upon the activation of the Edge-of-Dock. This feature will reduce the amount of wear on both the linkage bar as well as the roller pin assembly. The hinge tube and lip plate have been re-designed for a smoother transition without compromising the standard height differential of the Edge-of-Dock Leveler. JH Industries, Inc. provides a full line of Copperloy loading dock equipment. More information is available at out website (www.copperloy.com), or contact our customer service department at 1-800-321-4968 for information on your local Copperloy dealer. Twinsburg, Oh – December 2006 JH Industries, Inc., manufacturer of the Copperloy brand of loading dock equipment, is now offering a Steel Face Plate as an option for any new or existing JH Industries manufactured Edge-of-Dock bumper assembly. The steel face plate is a product which combats the issue of excessive bumper wear from trailer abuse. The steel face plate measures 11” (h) X 12” (w), is constructed from 3/8” steel plating and can be easily retro-fit to any existing JH Industries manufactured Edge-of-Dock bumper assembly. The steel face plate is inclusive of all the necessary hardware for installation and simply fits to the face of the rubber bumper(s) of the Edge-of-Dock. This product is sold separately as an option.